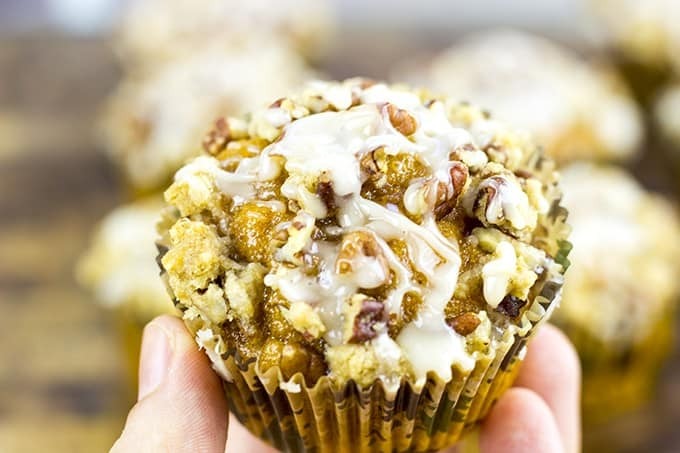 A delicious pumpkin muffin topped with a pecan streusel crunch and drizzled with a maple icing. It is all the amazing flavors of fall all rolled in to a delicious breakfast treat. These were originally meant to be delivered to my husband’s office and the morning after I made them I slept in and came into the kitchen after he left for work to find all the muffins except for one that was missing. I called him and asked what happened and he chuckled and said, “I tried one, I am not sharing these!” I laughed and said “That is going into my blog post!” So, sorry everyone at his office, I made these for you! It was so hard watching the blog yesterday knowing there was no post for you all to see! I am so ready to settle in to my new host for the long haul and I think I found a good place to call home. 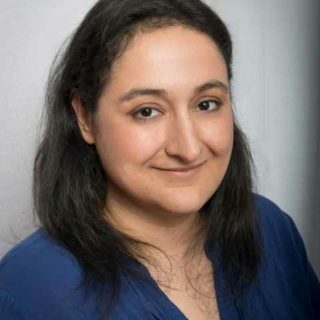 Some of my favorite large blogs with lots of traffic trust my new host so I feel confident we are all going to benefit from the awesome service they are providing. That being said I actually could not load this post on to the site because I had to wait for it to make its way on to the new host and I couldn’t log on until it was done. I totally kept busy all day to keep my mind off of it. I changed our cable provider and bought new cell phones. Now you know what I do when I am anxious… SHOP! Luckily I was home all day so I didn’t go out and buy the Mac desktop I was looking at last week… Everything in due time, first I need a desk for the computer to go on! Right now my desk is the couch and my computer is a laptop my husband got in law school years ago. Let’s just say I can go get a snack from the kitchen while I wait for Photoshop to open. 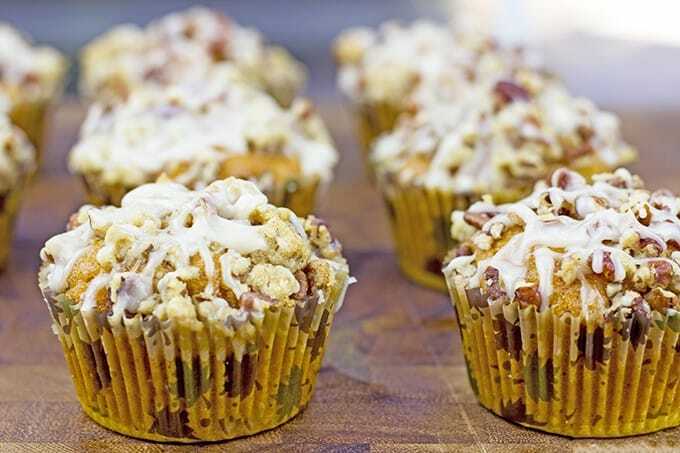 These muffins are really quick to make and the toppings can be used together or you can choose one or the other if you want something a bit quicker or simple. Preheat oven to 350 degrees. In a large bowl, whisk together the oil (you can also totally use half oil and half applesauce here), eggs, 1 cup sugar, ½ cup brown sugar, pumpkin, cinnamon, nutmeg, ginger, salt and baking powder carefully. Add in the flour and mix until just mixed. 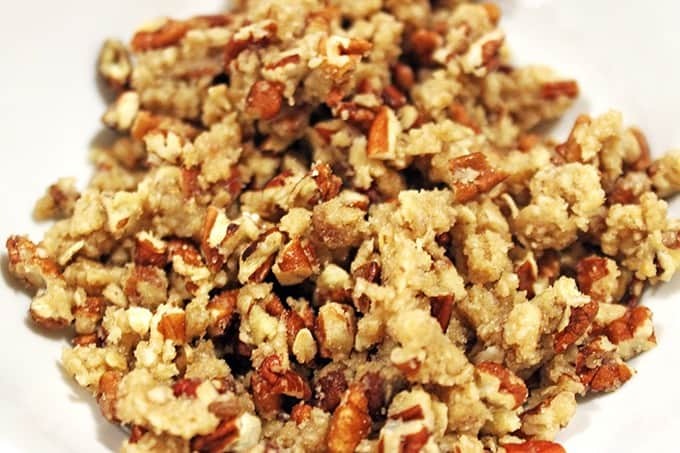 In a small bowl mash together pecans, butter, oats, brown sugar and salt between your fingers. Using a ¼ cup ice cream scoop, add the batter into some adorable Fall themed muffin cups. Top with a sprinkle of the crumble. Bake for 15-17 minutes. In a small bowl or measuring cup add the powdered sugar, maple syrup and milk until a nice thick icing consistency (a thickness somewhere between peanut butter and honey.) Microwave for ten seconds to thin out. Using a whisk, dunk it into the cup then shake it back and forth over each muffin to make a drizzle. Let Cool. 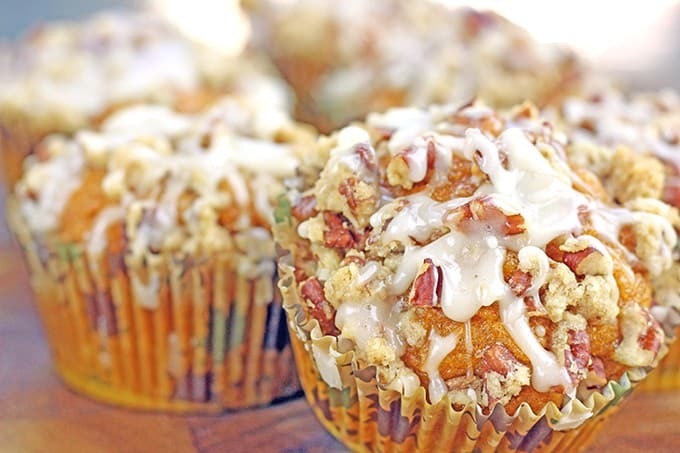 A delicious pumpkin muffin topped with a pecan streusel crunch and drizzled with a maple icing. It is all the amazing flavors of fall all rolled in to a delicious breakfast treat. 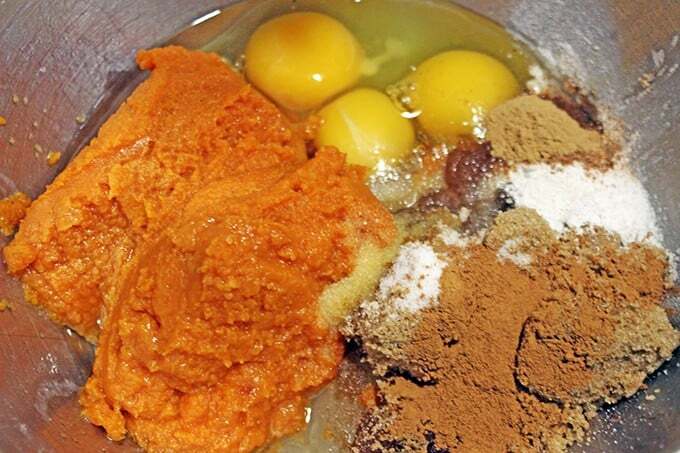 In a large bowl, whisk together the oil, eggs, 1 cup sugar, ½ cup brown sugar, pumpkin, cinnamon, nutmeg, ginger, salt and baking powder carefully. Add in the flour and mix until just mixed. In a small bowl mash together pecans, butter, oats, brown sugar and salt between your fingers. Microwave for ten seconds to thin out. 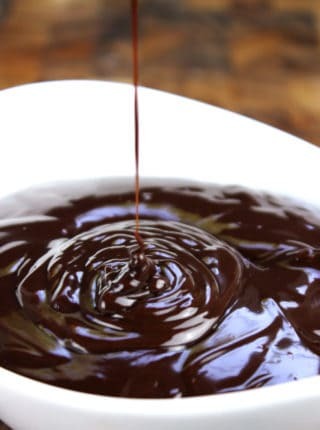 Using a whisk, dunk it into the cup then shake it back and forth over each muffin to make a drizzle. 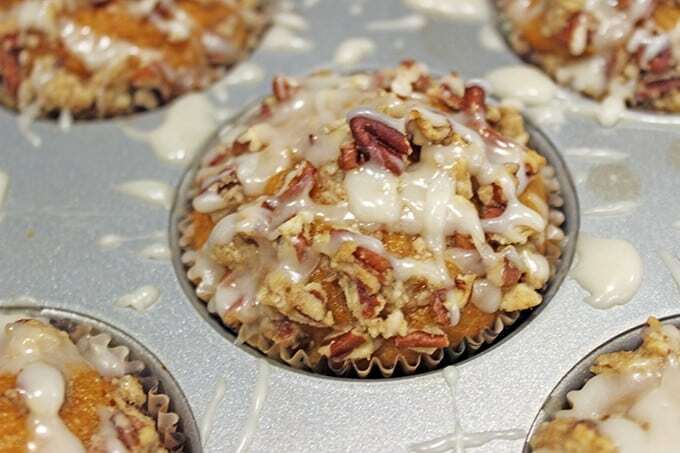 I Googled “Pumpkin Pecan Muffins,” and this recipe came up. I liked the look of the streusel topping and maple icing drizzle and decided to make them. I needed the muffins for an early morning meeting, so mixed all of the wet ingredients, made the streusel topping, and measured out the baking powder and flour the night before. I did use larger baking cups-the fancy straight-sided ones you find at really nice bakeries. (Sur la Table carries them.) I often find that pumpkin recipes yield a sloightly bland product, so I increased all of the spices slightly, and also included 1/4 teaspoon of cloves. It took maybe 10 minutes to get them in the oven the next morning. Due to the slightly larger baking cups, my yield was only 14, and I baked them for 18 minutes. When I served these beautiful muffins at my meeting, still slightly warm, everyone could not praise them enough! They far exceeded my expectations and I am definitely going to put them in my baking rotation for cold weather. Thanks for making me look good! Wonderful!! I am so glad you enjoyed them! And my pleasure helping you look good! Looks so good! Can you tell me the serving size??? Would love to help but I am not understanding the question. By serving size do you mean 1 muffin? The recipe makes a total of 24 muffins. If you mean nutritional info those are not numbers I calculate. Hope that helps but if it doesn’t I am happy to help if I can. This looks so delicious. What a perfect Fall Breakfast food! Thanks! They make me feel like the holidays are here! These look so good, I am drooling on my keyboard! I want to go make them right now for a midnight snack but I will control myself until tomorrow. The icing and the streusel! I could eat those on anything! 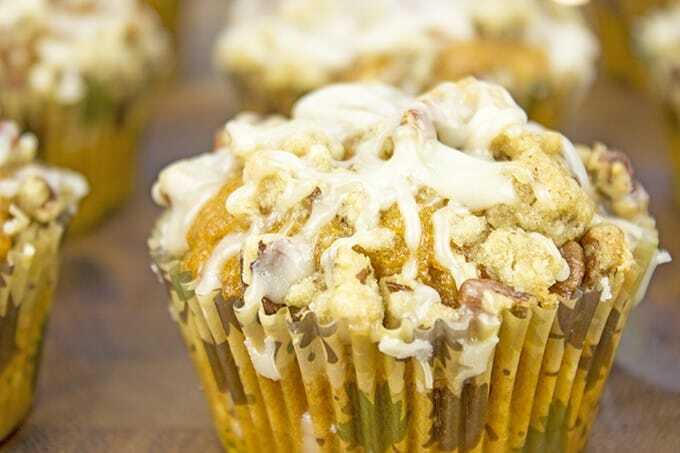 Well hopefully the host drama is over and we can see and get al the delicious and mouthwatering recipes that you got us used to 🙂 these muffins are perfection, and I would love to have one each morning for the rest of the fall! Yes! So far so good! Thanks Katalina! I am ALL over that streusel! These muffins look delicious! Oh yummy, and I just brought back some maple syrup from Canada that would make a good addition. These seem like the perfect midday filler or breakfast! Oh yes! I love Canadian Maple Syrup! When we visit Canada we buy all we can! These look perfect for the fall season. I love the combination of pumpkin and nuts too! Pumpkin is definitely my favorite fall flavor! These look absolutely delightful! Well, if we had to wait an extra day for a new recipe I’m grateful it was this one! These look absolutely scrumptious. It helps that I’m a huge pumpkin fan. I actually stock up towards the end of winter because it can be in short supply during the spring & summer. These look amazingly delicious and seem like the ultimate way to kick off fall. I bet the icing just sends them over the top! Yeah the icing is almost like cheating it is so good! Excuse me while I wipe the drool off of my keyboard… Whoa, these look incredible!! I think I need multiple batches in my freezer so that I can grab one every morning! Yum! Oh wow these look just amazing. I’ve never had anything pumpkin, but I am just waiting for the right recipe to try. This could be it! Looks so good. Yay! I win, haha. I hope you try it and love it! I love muffins with lots of texture and ‘stuff’ in them. 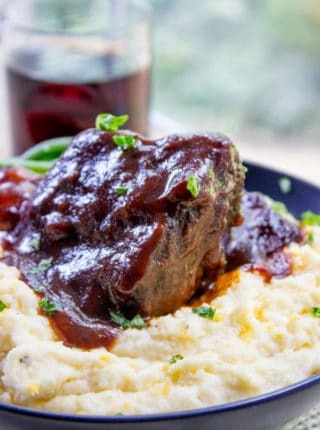 These fill the bill with such great fall flavor! Good luck with your new host. There is nothing worse than not having your website function as you need it to. Yeah so far so good. They were really sweet and helpful through the whole transition. I love pumpkin flavors in the fall. This looks like a delicious recipe. I will have to give this a try. Yes! Me too, I get so excited when it is pumpkin time! This looks so delicious. I will have to try making these on Sunday. We always do all of our baking on Sundays. These look like fall in a muffin tin! What a yummy treat for this time of year! Ok. Those look amazing. Need those in my belly stat. That looks so good! I will have to make some as soon as I possible! I think my family will really love them. I am so ready for fall recipes and these look scrumptious. I love anything with a streusel topping. Me too! I love this season! The kids are just laughing at me because I jot down the dates delicious recipes I want to make appear in blogs. I have had the worst time with printers this year and the wireless HP, which I loved, just totally quit! 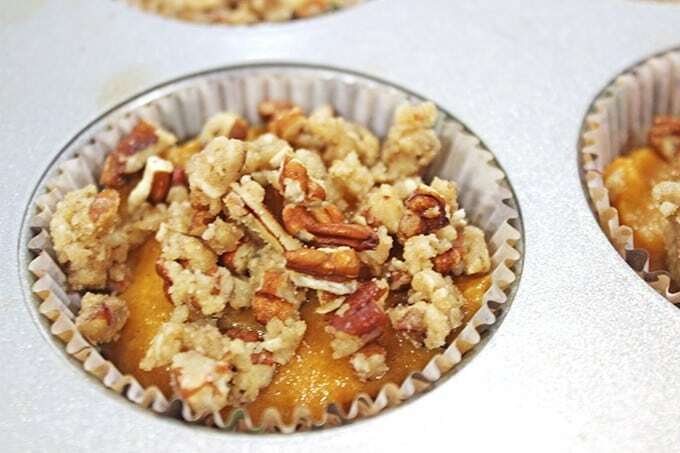 So I can’t print out the iced maple pumpkin pecan streusel muffin recipe today, but hopefully will get it done next week and give them a try. I hope you find a great desk very soon! Thanks! I actually had a similar issue with my HP too! I just switched to a brother laser printer because of it! This might be my first pumpkin treat of the season!! YUM. Woohoo! Doesn’t it just feels like Fall?! These muffins look amazing! I wish I was eating these right now! I would love to eat one right now for lunch. Sounds like a great lunch, haha. Mmmm…you say maple and I say, ‘I’m IN!’ Love this, especially now that fall is for real. I know, right?! I am so excited it is Fall! Those look so good! I love just about everything pumpkin. I may just have to make these real soon. I think they’d go over well for the holidays. Thanks Kathy! I bought so many pumpkins, I forsee this blog becoming pumpkin central in short order. Fall is my favorite season for weather and flavors! Sorry, should have clarified! I meant how many muffins it made, not nutrition (with as good as these look I don’t think I want to know!). I ended up making them this afternoon and made 19, but I made very large muffins. They are delicious! Definitely keeping this! Thanks for sharing your recipe. So glad they worked out for you and you enjoyed them! For me they made a perfect 24 in normal muffin tins with cupcake liners. I may have been able to squeeze a 25th out if I really tried, haha. I love these muffins. That streusel topping looks so perfect!! These look like such a great fall treat! My kids would love them! These muffins look so good. Worth the wait! I promised myself I am not propogating again until I go to a VPS, it always completely drains me emotionally. I know I only missed posting a recipe Monday but it felt like forever! Sounds delish! I have to try making these the night before and having them on school mornings. I am not a fan of nuts, but I know many people who would find these amazing! Yum yum! I have a love/hate with nuts. 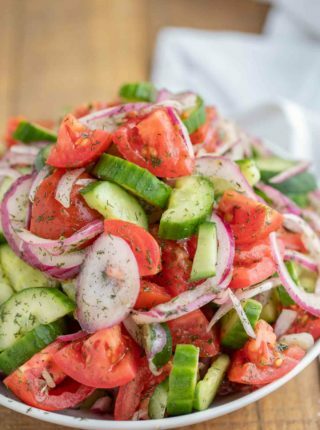 In savory food I normally don’t like the crunch but in baked goods and salads I am all about them! What a glorious way to start off Autumn! Oh I would love to wake up to some of these fresh out of the oven. These sound so good! This looks and sounds yummy. I love pretty much anything that has pumpkin in it. Thanks for the recipe. I bet those taste out of this world! They look SO yum! 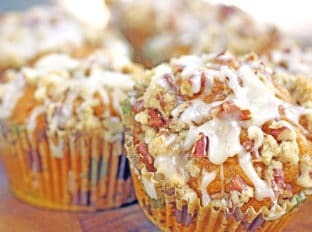 I will be making these for thanksgiving breakfast this year I think! These look SOOOO good. I love all things pumpkin. I will have to make these! They sound delicious!!! Yay! Pumpkin everything is back in a big way! Those look absolutely delicious. I LOVE that topping. Thanks Stacie!! I am so excited about the impending pumpkin takeover of everything baked! 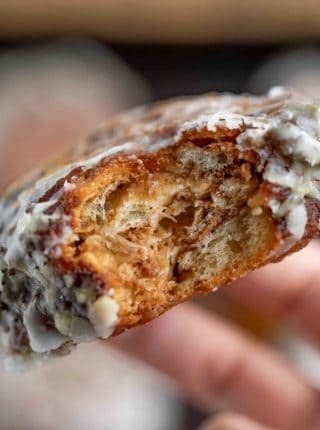 You had me at the words “pumpkin” and “streusel”. That looks so delicious! I like pumpkin flavored anything and everything! This sounds awesome! Me too! But by about a week of Thanksgiving leftovers I am pumpkin’d out until the following Fall. Gives me just enough time to gorge on all things pumpkin for two months! Those look amazing. They must taste delicious with all the different flavors going on.